Harold is living a simple existence, recently retired and busying himself from day to day with minor things, as well as ignoring the parts of his past that cause too much pain for him to remember. Some of this pain has caused a rift to divide his wife, Maureen, and himself to the point of seemingly no return. So, Maureen and Harold live with each other, they survive... but not much more. On one such ordinary day Harold receives a letter from a past coworker, one he hasn't been in contact with for years, her name is Queenie. Harold learns that Queenie now lives round 600 miles away and is dying of cancer, this news shakes Harold and makes him feel the need to do something substantial for her. Harold sets out to send a letter back to Queenie, but on his way he decides that a simple letter is not enough and continues to walk. On that first day of walking Harold meets a young woman who inspires him to have faith, faith that as long as he is walking Queenie won't die. 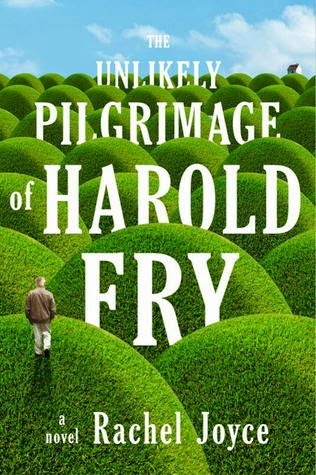 This begins Harold's long pilgrimage to save an old friend, but on the way he finds that he is actually saving himself and possibly his marriage. At times I truly enjoyed the simplicity of this novel, but at other times I wondered to myself it was a bit too simple. For instance, I loved the quote, "But maybe it's what the world needs. A little less sense, and a little more faith." This quote develops into a theme for the novel, but I felt that Joyce took it to a simplistic extreme for most of the book by making Harold's character have faith that not only will Queenie live as long as he is walking, but he can somehow save her life by walking to her. It is a beautiful child-like faith, but from an adult perspective I became distanced from Harold because I didn't understand why he came to have that specific faith perspective. So, the simplistic nature of the novel in general was charming and endearing, but it didn't delve deep enough into the messy human condition, even at times when the novel addressed deeper themes it seemed a little rushed or glossed over. Although I also found the work well written and was captivated by short scenes with minor characters in interesting landscapes across England, I also became bored in the details at times. There were a couple of moments while reading that I felt like I was reading some repeated variation of: Herald did this while thinking that and doing this. I got bogged down in flash-backs and wasn't caught up in the story enough. The results and consequences of Harold's journey were thought-provoking and when I made it to the end I was glad that I did. If you need an uplifting read that is elegantly effortless and sweet then this is the book for you right now. It was refreshing after reading serious and strenuous novels, as well as enduring some stressful parts of the holiday season. Lemon Balm Tea is a healing tea, especially good for anxiety and restlessness. This book is a book meant to heal, not only do we get to experience some of the characters' healing processes, we get to heal some of our own wounds while reading and enjoying a personally cathartic process. This tea will go nicely with that inner struggle, as we enjoy Harold's triumphs and mourn his losses hopefully we will be able to balance some of our own triumphs and losses too.